When learning how to cook vegetables, you will find a grilled corn recipe as well as any method of cooking fresh corn, the best results come from cooking it as soon as possible. Start with fresh ears of corn still in the husks. Pull the husk back without tearing them off. Remove all the silk and inspect corn for bad spots. Cut away any bad spots. When learning how to cook a grilled corn recipe leave two layers of husk on the cob and remove excess. Pull remaining husks around corn. Dip corn and husks in cold water and lay on a moderate low grill for 7 to 10 minutes. Any leftovers can be cut from the cobs and used in another corn recipe. It is delicious added to casserole recipes, in corn bread, mixed with other vegetables or just reheated and serve by itself. When you have learned how to make grilled corn recipes you will find one way is to pull back the husks and remove the silk from the ears of fresh corn; then close the husks tightly and bury the ears in hot ashes of the coals. Leave there for 30 minutes; remove from coals and brush down with hot melted butter. Another corn recipe is to remove husks and silk from corn; spread with softened butter and sprinkle with grated Cheddar cheese. Wrap each corn in heavy foil and grill 6 to 8 inches from hot coals turning every few minutes until hot and cheese is melted. When cooking out I often like to cut the corn off the cob and put in my big iron skillet. I then set in over the fire, and add butter, salt and pepper. This also makes a delicious corn recipe. In all ways good butter makes the corn taste great. Remove husks and silks from corn just before grilling. Combine butter and lemon pepper seasoning. Spread butter over the ears of corn. Place each ear of corn on a piece of heavy duty foil. Roll foil lengthwise around each ear; twist foil at the ends. Place over medium hot coals for 10 minutes. Turn ears of corn over and cook 10 minutes longer. Plunge the corn into a bucket of cold water and let it set at least two hours. 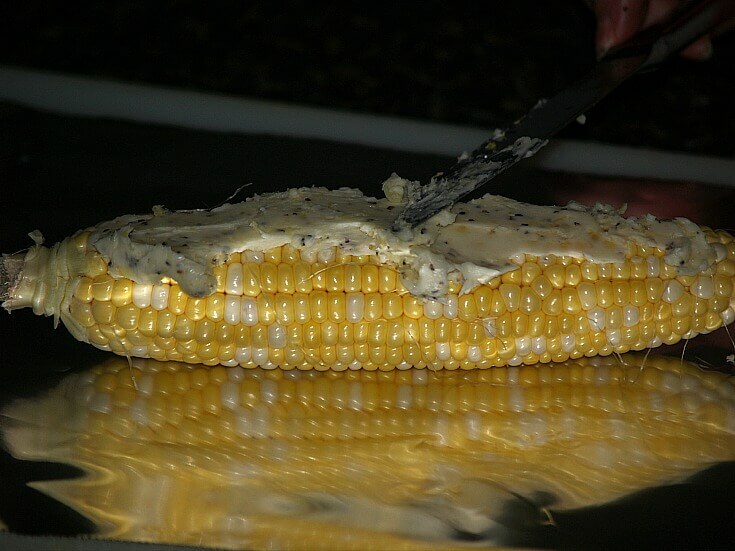 While the coals are heating in an outdoor grill, shuck the corn almost to the bottom of the cob; remove as much silk as possible. Rub the corn with butter and sprinkle with salt and pepper. Pull the shucks back up and tie at the top with a string or a piece of shuck. Place the corn on the grill and cover them with a wet, wrung out gunny sack (burlap sack- often grain, potatoes etc are bagged in) to keep in the steam. Roast 15 to 20 minutes, turning frequently or until the corn is cook through and you can smell the delicious fragrance. Cut 4 pieces of heavy duty foil (18x12 inches). Spoon ¼ can of the chili beans on each foil. Top each with ¼ of the sliced onions. Top each of the onions with 1 slice of cheese. Top each cheese with a hot dog and 1 ear of corn. Wrap each packet securely leaving room for heat expansion. Cook 20 to 30 minutes on grill rearranging package often to cook evenly. 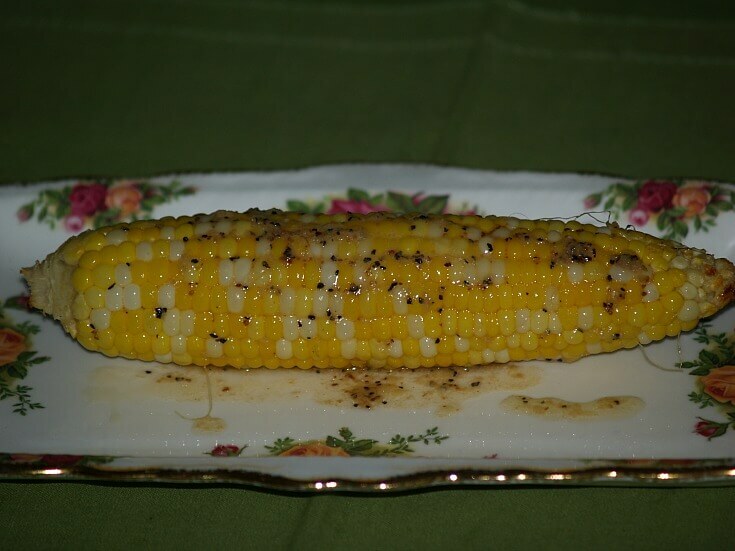 You can replace canned whole kernel corn with leftover grilled corn; just add a little milk for right consistency. Sauté onion and green pepper in the butter. Combine all the ingredients except for the cheese. Pour into pan and bake for 1 hour. While hot, sprinkle cheese on top and let melt. Mix all ingredients together except for the 2 tablespoons melted butter and the ¼ cup of cracker crumbs. Mix together the 2 Tablespoons melted butter and the ¼ cup of cracker crumbs and sprinkle on top. Mix together all ingredients except for the last four. Mix together the 2 Cups of cracker crumbs and the ½ cup of melted butter. Sprinkle the almonds on top of the cracker mixture. Top casserole with French fried onions.